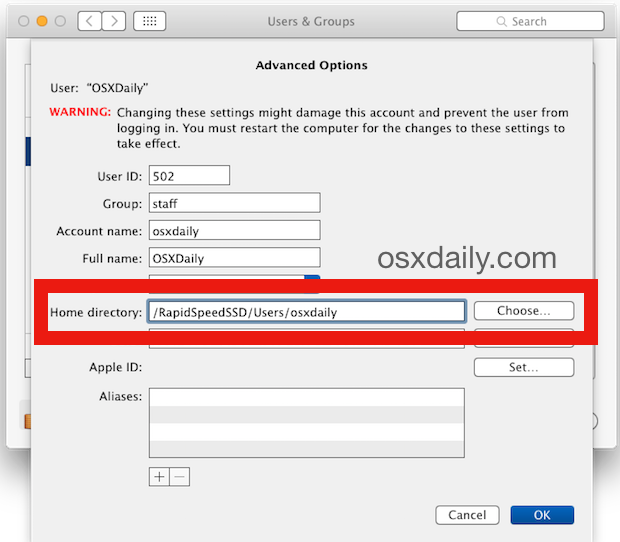 Changing the location of your home directory is pretty easy in Mac OS X, and it can be desired for a variety of situations to store a home folder elsewhere on a Mac, or even on another drive. This is valid and works the same in all versions of OS X. Though it’s not particularly difficult, moving a home folder is somewhat advanced and therefore should not be attempted by users who are not sure what or why they’re doing it. Always be sure to back up your Mac before making any modifications like this. Now as I mentioned before, if you don’t have a compelling reason to change the location of your home directory to somewhere else, don’t do it! You can really mess things up. * You have a smaller Solid State boot drive and you want to conserve disk space, so you move your home directory to another drive source (obviously this isn’t practical on a Mac with only one internal hard disk). If you’re thinking of doing this, there are some additional steps to take to be sure everything is flawless when changing your home directory location. Moving home folders is a great way to establish disk quotas on a shared machine. I have four kids who share a Mac, so the drive has 5 partitions: One for the OS, and one for each kid. Their home folders are on their own partition, which sets a hard limit on how much disk space they can hog, and the OS partition is frozen with ARDs Deep Freeze. Permissions keeps each partition private form the others. 4 Kids sharing a Mac and NO maintenance issues for over 3 years! And if I ever want to do a clean install of the OS, I can re-format the OS partition without touching any home folders. It’s not really a good idea to move your entire home folder to another drive if you want to gain significant speedups from an SSD since lots of small config etc. 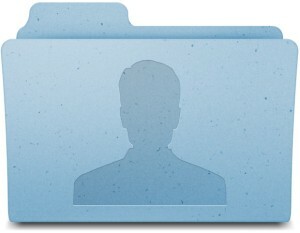 files are stored inside your home/Library/… folders. Instead just move the big stuff (Pictures, Movies, Music) to another drive and symlink them back to your home folder. Yeah, but it can be a really good idea if you want to use File Vault, and you’re already over 50% of your boot drive capacity, and the reason has nothing to do with Music/Movies/Pictures. Yes but the control click on the user doesn’t work under OSX lion anymore. How to get around it? It does work in Lion. Did you unlock the controlpanel before you control clicked? I confirmed that it advanced user options works in OS LION, be sure to unlock the padlock prior. I have some one in my Mac Pro group on Facebook, http://www.facebook.com/groups/vintagemacpro , that is having an issue with his home directory on his SSD, and creating a new symbolic link seems to difficult for him, is there a easy GUI tool for newer versions of OS X that do not have the advance option tab in users and group? I’ve used this. It’s recommend by a lot of IT Admins because it’s stable, reliable and is easy to use.